Your Family, Agile, and You: Permanent task boards are nice, but they aren’t the point! Permanent task boards are nice, but they aren’t the point! What do we do with all the permanent tasks? The ones that repeat themselves again and again? Those that we’ll be moving across the board every day? One of the ways of creating Agile boards in the house is to reverse the columns. Well, instead of moving tasks through the columns, as we’ve shown in the book and previous posts, we put up a board with pre-defined tasks per family member, which are seen throughout the week, and add a ‘Doing’ note to the task in question. I can see these boards posted everywhere. They are colorful, delightful, and some even have every possible task you can imagine that you would ever do around the house. And that’s EXACTLY what bothers me. People, don’t forget. The task board isn’t the point. The point is the way we treat tasks! The point is communication, around the tasks at hand, with an emphasis on empowering the child, developing his responsibility and his commitment to the tasks, together with a healthy family dialogue, like I show in the Agile Kids book and in previous posts. The family dialogue pulse is what matters. The task board is just an answer to a symptom, which can be disorganization, or not doing the chores around the house. The task board isn’t the goal. We have to understand that setting up a board is just a means to more important goals. 1. Talk to your kids and build the list of permanent tasks together. This simple activity creates the initial understanding of tasks, and enables us to hear what our children think about the tasks, and you’ll be surprised at what they have to say. You might find that just from these conversations you can already agree on ground rules that will prevent arguments in the future. Don’t force them. Don’t come with a pre-defined board and present it to them as a given. There can be some tasks that may cross some undetermined line (such as when to go to bed), but in an open discussion you’ll be able to present them as part of all the tasks. 2. Be prepared. Think in advance what you want to achieve. You can’t just pile a whole lot of tasks on the board, which makes it difficult to see who is doing what and when. 3. Focus is important. Choose the really important tasks first. With time, you’ll be adding more tasks anyway. 4. 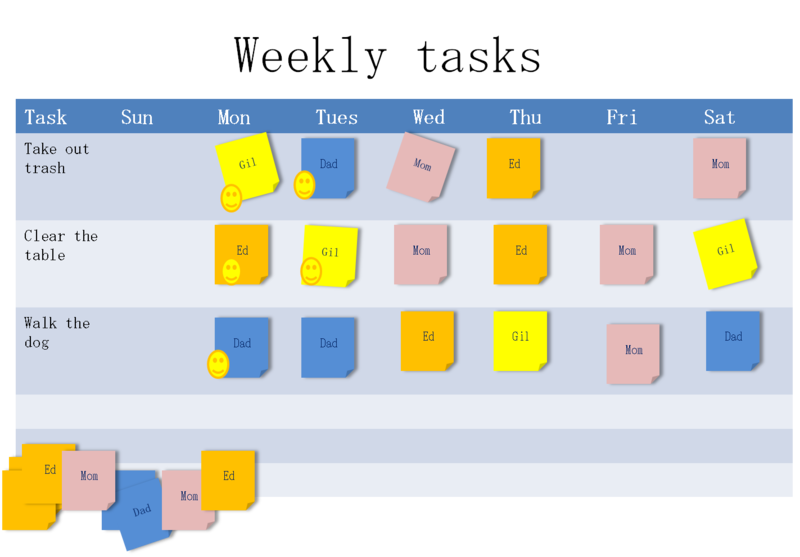 The children can create their own schedule from tasks that they are each interested in doing during the week. We’ll keep track of the schedule, and mark each task as done. 5. Put the tasks on the board together with your children. Visibility gives a sense of control, and is the first step towards taking responsibility for our tasks. This means that the children have to be part of creating the task list. 6. Put the board in an easily accessible part of the house, where everyone can see it. A task board that’s put in a drawer is useless. You can’t see it, and it doesn’t create any awareness of tasks and responsibility. 7. Meet once a day, and talk about the tasks. 8. Make sure that the children are the ones that move the tasks on the board, not you. Let them choose and mark the tasks - not you. 9. Make sure that the tasks are more or less balanced, and that the brunt of the tasks fall on one family member. 10. You need to put your tasks on the board as well. This creates trust.